This is more of historical record, than a destination. The Paramount Hotel is a large hotel [nearly 600 rooms] at 235 West 46th Street, and was originally completed in 1928. 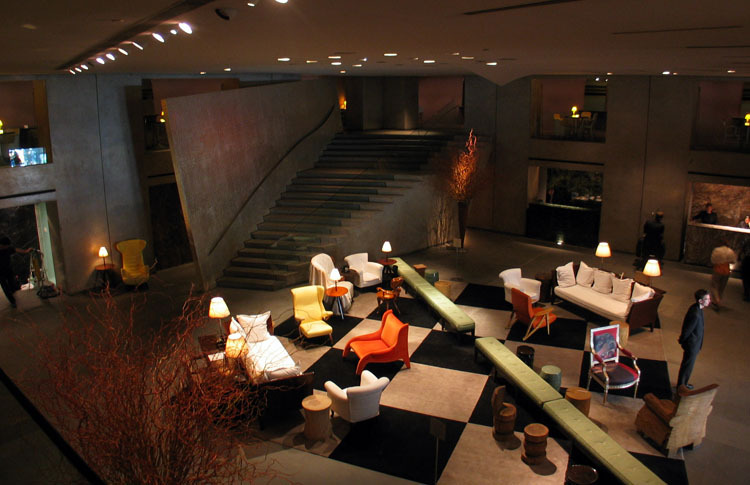 It was acquired by Ian Schrager, and Phillipe Starck remodelled the hotel in 1998 into a design icon. The bedrooms were small. simple and sparsely furnished and you felt you needed to suffer a bit for your art/architectural tour. But the lobby…like a stage set, particularly in the evenings. You can still stay, but the hotel has been sold on a number of times since the Ian Schrager days.